A simple rounded toolbar with grey buttons. If you want to implement a "radio button behaviour" (when you click on a button this button keeps selected and the other are un-selected) without drawing the radio circle, just add SWT.HIDE_SELECTION to the constructor of RoundedToolbar : new RoundedToolbar(shell, SWT.HIDE_SELECTION). 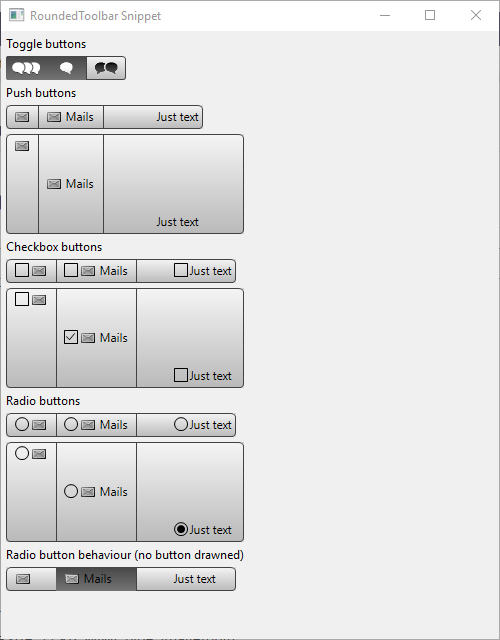 Actually, the buttons can be PUSH BUTTON (default behaviour, SWT.PUSH), RADIO BUTTONS(SWT.RADIO) or CHECKBOX BUTTONS(SWT.CHECK). An example called RoundedToolbarSnippet.java is located in the plugin org.eclipse.nebula.widgets.opal.roundedtoolbar.snippets. This page was last modified 07:24, 15 April 2018 by Laurent CARON.